If you look at this page via a Windows browser, there should be a logo on left side of the tab at top, a little green-brown-yellow blob. The photo was taken in 2013 (with friends alongside: LT and HG), and it was added at the very last second on the very first post written later that same year. If you have looked at this web site once or a thousand times (thanks, mom! ), the duck has been there, on whatever device you use, each time. It is this site’s mascot, a companion to each piece I write. In 2012, I was diagnosed with a still-undetermined form of spinocerebellar ataxia. (I just noticed that the word “spinocerebellar” now freely flows from my fingers as I type it; I insist on Wikipedia’ing the word to check the spelling—to preserve the illusion to myself that this is still new to me—but it is now forever in my vocabulary. Is Wikipedia-ing a verb?) This disease is progressive, degenerative, affects balance, and weakens one’s legs. In May 2014, a new neurologist was assigned to me and he corrected the first diagnosis to something else, spinal muscular atrophy type IV. Friedreich’s ataxia, the first diagnosis, carries with it a shortened lifespan, and can be a diagnosis that carries with it more than a few nights lying awake and staring into every abyss one thinks is on the other side of any anything that may possess two sides. SMA is degenerative, affects balance because the lower legs are weakened, and is life-changing but not necessarily life-shortening when the symptoms appear so late. (Unless I fall into traffic because of it.) My symptoms have gotten worse since I first published a column about my SMA; now, in 2017, I have more difficulty standing. For safety’s sake, we are the proud owners of a shower bench. I had difficulty typing that sentence, but my SMA had nothing to do with any typing issues. Sometimes my ego stands between my fingers and the keyboard. My symptoms first appeared in 2006 or even earlier, I now realize, when my walking began to slow. I was always a rapid walker, and I felt like I was moving my legs with the same vigor I had always moved them, but the time it took for me to complete familiar walks was getting ever longer. Even in 2005, while mowing a friend’s lawn, I noticed that it took me longer than it “ought to.” My legs were tiring easily. Finally, I started to run late for appointments (most precariously, my job across town) and I perennially underestimated the time it would take me to walk somewhere. All this was new. I shared what I was experiencing with no one, except to promise when my lateness was noticed by authorities like my employer that I would “do better” next time. In the summer of 2013, some friends and I made frequent visits to a pond at a local college campus, SUNY New Paltz. A once-upon-a-time make-out spot in the 1990s for the one of us named me, that year it instead became a quiet place to get away from some turmoils in our lives. Several species of waterfowl live on the pond, which is nonetheless quite small. 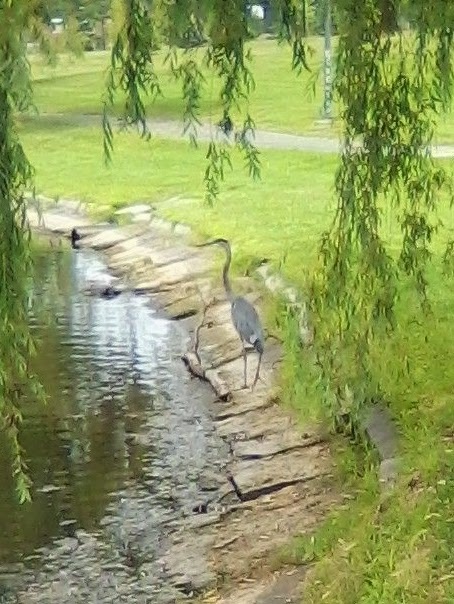 One day a blue heron came by, which is a common but always special sight in New Paltz. It hung around long enough for me to photograph it walking along the shore. I walked a few paces behind it for a dozen yards or so. It could walk faster than I could I noticed, and walking isn’t even its go-to move for travel. There are usually a few breeds of duck on the pond, and my friends and I became “expert” in observing the inter-species social behaviors of the different breeds. (In a word, some breeds are just plain bullies, even to humans who are feeding them breadcrumbs.) We developed story lines about each duck family’s day. One family of five, a mother duck and her four ducklings, became “my” family. This was because one of her offspring was lame, like me. He or she—I decided he was a he, but I believe it is a she (those who know about such things can tell immediately when looking at the photo at top)—appeared to have a broken or sprained right leg. Cute and small as they all were, the four of them fuzzy and adorable like they were perennially posing for a children’s book cover, the siblings would push him away from our breadcrumbs, but he always fought hard for his share. Broken or born that way, he held his leg tucked alongside, which forced him to remain seated on the ground when the others were toddling towards the crumbs. Then, in a flurry of action, he would start to wobbly waddle, but he was perpetually a few steps behind. He was slow in other ways, too: by the time his siblings were free of their baby fuzz and displaying more grown-up plumage, he still had some fuzz. I saw that, even with his right leg held in a crook, even sitting awkwardly on the ground, once he started walking, after a few unsteady strides he would catch up to his siblings. And he honked just as loudly as they did, told the others to mind their manners at the top of his voice. In the water, he appeared to swim as quickly as the others. It was when walking that any differences became apparent. In 2008, the bizarre sensation of being always on the edge of a fall became a part of my life. I could not walk across a parking lot without first looking across it to target which cars I would use as props for my unsteadiness. I started to walk with a cane. Faced with the prospect of crossing an empty parking lot—at the time, I worked for an electronics retailer whose name rhymes somewhat with “Lady O’Shack,” which frequently locates its stores in open-air plazas, so that is why I have twice mentioned parking lots—I would look for an abandoned shopping cart (there was a grocery store nearby) and use that as a makeshift walker. As before, I shared what I was experiencing with no one, except sometimes I made jokes about walking with a cane—I named it “Michael,” as in the actor, Michael Caine—and I did not have a doctor, because I was 40 and a guy. I did not have a doctor, because 40. I was 40 and my legs felt like they were in boots nailed to the ground. I would take a step, or at least my brain sent the signal, only to look down and find that neither leg had moved. By 2011, completely foreseeable life circumstances had given me the beautiful gift of poverty and thus Medicaid. Now able to afford a few visits to a neurologist, (there were paid for in full) I underwent the series of tests that led to my diagnosis. But on our next visit, two weeks later, he was still there. Of course he was. He still missed every first chance at breadcrumbs—even those that I tossed specifically at him—but he fought his siblings to get his crumbs once he started moving. They still pushed him away from their second and third chances at crumbs on the ground, but he was louder than the others and was getting faster, even limping, but doing something like using his lame limb like a cane. He was using his lame leg. I use a method of walking that I devised without knowing what I was doing: I push off with my right leg, like a right-handed pitcher, and swing my legs under me, using the cane or a walking stick to tap a rhythm. It is difficult for me to stop suddenly, so I do not do that. There are days where I do not know what my legs are going to do and we seem to educate each other. So the photo at top is of “my” duck, closer to fully grown in July 2013, waddling up to me, as if it knew that I was someone it knew. The duck would take two steps at a time and then pause or plop down, then would take a couple more. First his right foot, then his left, then a stop and reset for another pair of steps. He did not come as close to us breadcrumb tossers as some of the others did that day, but he fought as valiantly as any duck that I would call mine should. This is the photo that accompanies this blog, next to The Gad About Town name. It is my duck about town. All these years later, almost four years now, I do not imagine that my duck about town is about any town, New Paltz or otherwise. I presume it has joined its duck ancestors in duck Valhalla (not the one in Westchester). I could fantasize that it has flown everywhere that ducks travel in these last few winters, but it seems unlikely. Of course, it proved me wrong once before. Its photo has traveled far and wide, though, via this web site. And the lesson it taught me the summer of 2013 is with me, with each step that I waddle. This is an edit and update of a piece from 2014.